On August 20th we did our first podcast interview and I learned so much. This is a good thing. My guest was David Wallace from 5th Avenue Energy and we explored sustainable energy, electric vehicles, Elon Musk, guys installing solar and so much more. Fascinating discussion. David and I are already planning another discussion where we can really focus on a specific topic and go deep. The California plan to phase out fossil fuels by 2045 is our likely topic. My Mackie mixer turned out to be a big problem. I could not get the USB output to property partition the audio into separate channels in Adobe Audition. After further investigation, this was simply a limitation of the mixing console. I later discovered that I also could not have more than 2 channels feeding from the mixer into my computer, so this would not allow for larger group broadcasts. 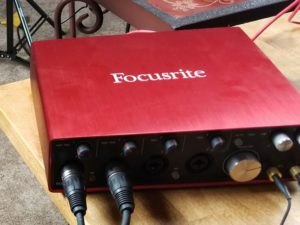 So I ended up getting a Focusrite Scarlett 18i8 Audio Interface (see photo below) and this device is awesome. It can handle 4 XLR microphones plus numerous 1/4″ inputs, integrates perfectly with my laptop and can sync with Adobe Audition in specific audio tracks. Plus there is less background noise than the mixer. Live and learn. I have spent time in both Adobe Audition (audio) and Adobe Premiere Pro (video) training myself on the software. Always great to learn new things. I have the basics down pretty well. These tools are loaded with features that will allow me to experiment as I work on this creative project. I fully expect the audio/video quality of this project to continue to increase as we move along. I enjoy listening to the Joe Rogan Experience podcast and his shows can easily go over 2 hours, often 3 hours. That’s a ton of time for a listener to grind thru. I figured this first episode I would let it freely flow until the discussion came to a natural end. This ended up being 2 hours. While a listener may be able to get thru that amount of time on a topic they like, I think it is still too long. I found as a participant my focus was not always at 100% and I am sure listeners will be able to pick up on that. So I am going to aim for shows to be 45-60 minutes. It won’t be an iron clad rule, but that will be my goal. My guest and I both need to put forth much more energy. It’s not simply having a conversation amongst yourselves, it also has to be interesting and entertaining for the listeners. Ultimately, I think my initial podcast with David was more like a private, soft opening of a restaurant. A good chance to practice, work through a few bumps in the road and to identify problems that need to be corrected. We hit on all of the above. All great things as I get this project underway. I have not yet decided to post this initial podcast. I remain committed to doing the podcasts as unedited discussions that are real and authentic. I am focused now on booking guests. Two local politicians have agreed to do a podcast. One is booked this weekend. I am planning to send out invites to more local personalities. I will be laboring on my project this Labor Day weekend. That’s my version of geeky fun. Enjoy yourselves!